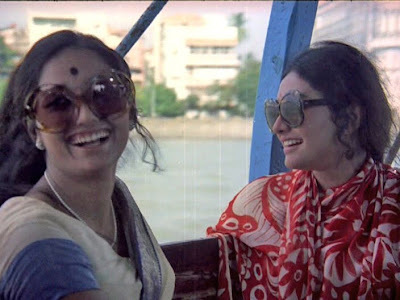 This picture captures a significant reason I love 1970s Hindi cinema so much: funky, spunky ladies having a great time. Okay, I haven't seen this movie so I don't actually know what's going on, but just as an isolated moment, this looks so wonderful. They're stylish, they're having a blast, they're probably on some kind of adventure or zany project, they're out in the open, going somewhere together, smiling and free. Love! I adore the sunglasses and I want a pair right now. Same with the saaris - they look so simple and light-weight. Thank you, Beth - A+ image. Could I also ask where the stunning Rishi-Shashi tumbs up header is from [and whether you might by any chance have an un-PS'ed still that you could share], please? Kanan - I know, right? SQUEEEE! I found the film itself dull dull dull---but the outfits and especially the sheer volume of oversized superfly sunglasses compelled me to sit all the way through it. They were FAB.